This year, the HPSO and Garden Conservancy Open Days Tour is featuring five fabulous Clark County gardens on Saturday, June 11th, from 10 am to 4 pm. Last Sunday, I joined a pre-tour event with two of my blogger buddies, Amy from The World's Best Gardening Blog and Scott from Rhone Street Gardens. Come take a look! The Seymour-Luck Garden featured a Japanese influenced landscape that displayed a giant stone rill and art work from the owner. A rain chain of gingko biloba leaves cast lovely shadows onto the stones on a hot June morning. The massive stone rill delighted me with the sound and movement of water that you even get to step over on the path. What is a rill? A rill is a small channel that channels water. The focal point of the red glass bell drew us down the path of stones surrounded by mounding moss. The owner, Greg, is a glass artist and the addition of his art added a personal note to a quiet thoughtful garden filled with artistic details. The Ritchie Garden featured vistas of their ponds surrounded by large gorgeous trees and shrubs. A frog splashed into the pond as I took this picture. Dragonflies and wildlife thrive in this garden. The five acre property started out as a wetland that the Ritchies carefully planted to create structure and views. The picture below is the view from the Ritchie's back patio. What a beautiful view! The Bailey Haven overflows with Linda's love of gardening. She has taken an acre of clay and transformed it into a delightful space filled with ponds, paths, various garden collections, and gazebos and other structures. Linda greeted us at the front of her beautiful home and said, "let me take you back to the real garden." Her back patio featured a lovely entertaining space that led to a lovely water feature and a path to the back gardens. 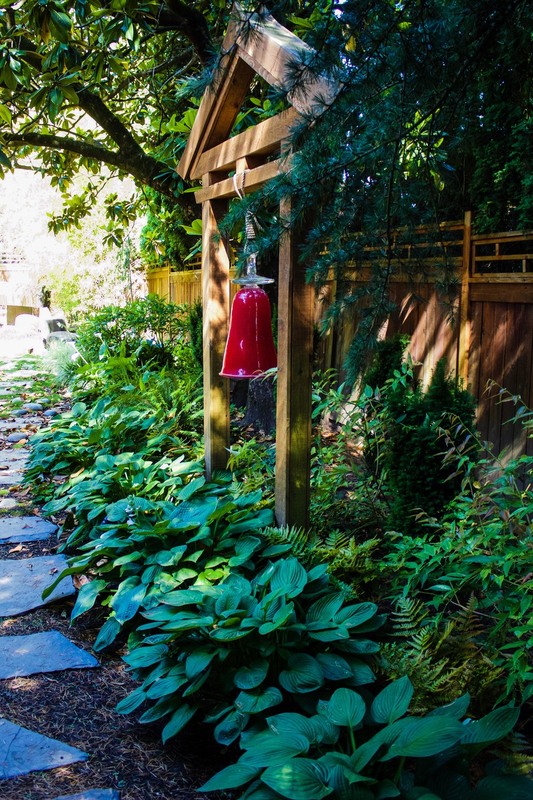 She playfully intermixes color and textures throughout her garden. The raised gravel bed artfully pairs conifers and succulents together. Linda said that this bed quickly became her favorite. I can see why. When I asked Linda, what her favorite time of day was to be out in her garden was, she quickly quipped, "all day!" Dragonfly Hollow is home to garden designer and author, Vanessa Nagel. I'm re-reading her book, Understanding Garden Design: The Complete Handbook of Aspiring Garden Designers, so it was an extra special time for me to explore her garden. The dragon mosaic is fabulous and has won awards. This quiet focal point helped us pause for a moment. Vanessa has written about the punctuation of plants in the garden. But, to me her garden feels musical. There is a rhythm in the planting and a tonal quality of the colors, especially the red, that she repeats through the space. The Matsu Kaze (Wind in the Pines) garden is an enthusiastic 2 1/2 acre collectors garden filled with rare and unusual conifers, gingko, Japanese maples and so much more. I first toured Judy and Roger's garden three years ago with My Pirate and we got lost. It was a delightful lost, the kind where you hope you don't find your way back to reality too soon. The garden has really matured in the last three years and they've added even more berm beds filled with all sorts of treasures. The garden features many different structures, water features, and gathering spaces. I love the fire pit area below. The five gardens showcased five completely different styles and personalities. I highly recommending touring them this Saturday, June 11, from 10 am to 4 pm. Click here for more tour information. I promise that you'll leave the tour with many new ideas and feeling inspired. I know that I did! Tickets are available at each garden for $7 each. Or you can buy all five for $30. HPSO members can purchase tickets online until Friday for $20. The HPSO uses their earnings from this event for grants and scholarships. It's a great cause. The school garden that I volunteer in has been a recipient of HPSO grants. We are grateful for the support of the HPSO.